Iowa law enforcement agencies are putting new measures in place to help quickly locate “endangered” persons. The effort involves a partnership with the Alzheimer’s Association of Iowa. Executive Director Carol Sipfle says 69,000 Iowans have Alzheimer’s or some type of dementia and the number is growing with the aging of the baby boomer population. She says 60% of Alzheimer’s patients will wander off or become lost at some point during the course of the disease. “People who wander with Alzheimer’s are vulnerable because of their memory loss, their impaired judgment and other losses in their cognitive functioning,” Sipfle said. “If they aren’t found within 24 hours, more than half of them will suffer serious injury or death.” The Iowa Department of Public Safety launched the Endangered Person Alert (EPA) system with press conferences today (Tuesday) in Des Moines, Council Bluffs and Cedar Rapids. Siplfle says the EPA system is designed to help Iowans with Alzheimer’s who wander by improving communication among law enforcement agencies and notify the public when searches are underway. 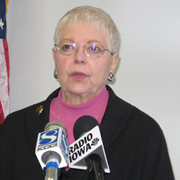 Melva Berkland of Ames spoke at the press conference in Des Moines. Her husband suffers from Alzheimer’s and she choked up while describing an incident earlier this year when he wandered away from home. “After I called the police, I called a good friend in the neighborhood and she came to be with me. She helped me to think more calmly,” Berkland said. “I also called a couple of other (friends) and asked them to pray for my husband’s safe return.” Berkland’s husband was found safe, but he could’ve easily been hurt. Berkland says her husband called her from a motel and asked her to come get him. “He had wandered six miles by walking in the dark of night,” Berkland said. Iowa State Patrol Colonel Patrick Hoye says the new EPA system will used by local police when a missing person report is filed. Hoye says it’s similar to the Amber Alert system used for missing children, although an Endangered Person Alert may not involve contacting media statewide. Amber Alerts are also issued through electronic signs located along Iowa’s interstates. “Routinely, we probably would not use the message boards (for an EPA) unless we had reason to believe the subject might be traveling in a car and we have a specific vehicle and things like that,” Hoye said. In Iowa last year, 780 adults were reported as missing. More than half of those individuals were described as endangered or disabled.